Eco-labelling of timber products is around the corner with the launch of the Forest Stewardship Council, which brings together businesspersons, environmentalists and human rights groups. THE WORLD'S first certification system for "sustainably produced timber" has been set up. At an early October meeting in Toronto, environmentalists, businesspersons and human rights groups launched the Forest Stewardship Council (FSC), which will verify claims that wood products and wood pulp come from sustainable forests. Producer countries have treated the idea of certification with derision. Nevertheless, some of them have started creating government infrastructure for certifying their own forests, thus negating the need for independent certification. 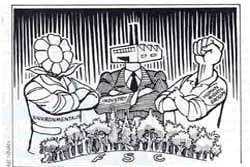 The effectiveness of FSC is also in doubt because influential environmental groups such as Friends of the Earth (FOE) have withdrawn their support from it, protesting against business being granted voting rights and seats on the FSC board. "It is a dangerous and unnecessary compromise to involve industry in the process of determining the environmental standards by which industry is judged," said Simon Counsell of FOE. Francis Sullivan of the Worldwide Fund for Nature argues, "We have got a compromise. Industry has a say, but it does not have control of FSC. The writing is on the wall for those who do not pay attention to the social and environmental issues affecting their business." Business groups, however, supported the launch of FSC. Mark Eisen, environmental marketing manager of a large US business concern, said, "FSC will legitimise the process of certification. It will give us more credibility in our efforts to get our supplies from sustainable sources." The establishment of the Council has also pleased human rights groups because extensive deforestation can adversely effect the lives of indigenous groups and other people living in and around forests.